Located in sunny Kihei, this resort is set amid tropical gardens with waterfalls and ponds. Stroll to Kihei town, Kamaole III Beach Park and one of the best swimming beaches on Maui. Select from one-, two and three-bedroom suites with full kitchens, large private lanais and washers/dryers and enjoy a pool, kids' wading pool, tennis, jet spas, BBQ grills, fitness center and a weekly Mai Tai party. Wailea's shops and restaurants are nearby. Across the street from Kamaole Beach Park #3, 5 minutes from Wailea, next to Maui Park Shore and near boat harbor. 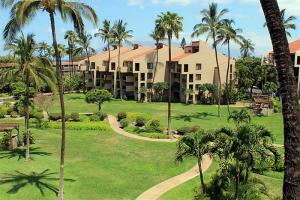 Approximately 25 minutes from Kahului Airport. Sandpiper Grill Restaurant and Barbecue Facilities On Site.